There are many films based on faith. Some of them are good, some of them not too good. However, it never fails to deliver its point. The story being told in “MIRACLES FROM HEAVEN” is truly inspiring, beautiful, and touches your soul. It goes through your vein right up to your mind, where it will stay forever. It’s a story of a thirteen year old girl who had a rare digestive disorder but finds herself miraculously cured after surviving a terrible accident. Miracle or not, whatever it is, it should never be missed to be seen. Strange or not, but this film has a strange power to grab viewer’s attention right from the beginning. It’s beautiful score narrates its own story as you find the Beam family enjoying their ideal life in Texas. Everything goes smoothly for this adorable family. Anna (Kylie Rogers), Abbie (Brighton Sharbino) and Adelynn (Courtney Fansler) are three sisters who enjoy going to school. Kevin (Martin Henderson) and Christy Beam (Jennifer Garner) are busy at their farm. But soon, the problem comes out of nowhere, when Anna all of a sudden starts throwing up food. One of the doctors at the emergency says she is lactose intolerant. With so many diagnosis, nothing seems to help Anna recover from this strange disease. While her stomach fails to process the food, her tummy gets bigger and bigger causing her inexplicable pain. Christy finds out that there is only one specialist that possibly can help Anna, Dr. Nurko who practices in Boston. Being almost out of money, the Beam family sacrifice their last penny to ensure that they will provide every resource to help their loved one. But to their great disappointment, even the caring and extremely kind Dr. Nurko fails to help Anna, as the family prepares for the worst. But when an accident occurs at the farm, where Anna, almost months away from dying, falls on the inside of a big tree. After that suddenly, Anna starts feeling better, and soon even her digestive disorder will disappear. As the family is caught in shock, nobody, not even specialists can explain the reason of Anna’s speedy recovery from the incurable sickness. 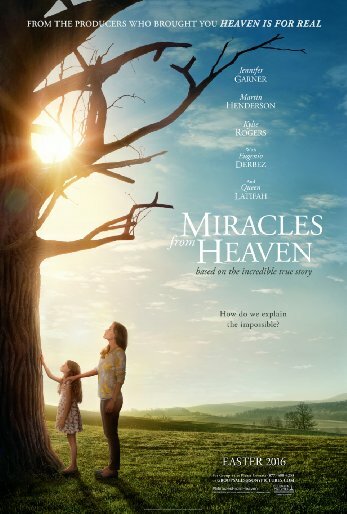 “MIRACLES FROM HEAVEN” is built on complete emotions. It’s hard to watch it without tears, even if you’re a non-religious viewer. However, anything that happens in this film is the consequence of kind actions coming from human beings. There’s a scene when Kevin at the airport tries to pay for airline tickets but the system keeps declining his credit cards. When the operator overhears that they are in a rush to get to a hospital before Anna dies, he pretends that he had an issue with his computer and issues them a ticket just like that. The scene when Christy at the Boston Children Hospital desperately begs for an appointment with Dr. Nurko, a newly hired receptionist shows mercy and she personally asks Dr. Nurko to see Anna as soon as possible. Despite Patricia Riggen’s film being beautifully directed, it’s Kylie Rogers, Jennifer Garner and Eugenio Derbez as Dr. Nurko who steal the entire film. Kylie Rogers as Anna delivers a fabulous, deep and profound performance, while Jennifer Garner is simply at her best. By looking at her performance, you understand being an actor is not enough to perform such a difficult and emotionally charged role, but being a mother, and understand the pain of Christy Beam is what is required to do what Garner did. It’s truly amazing. Eugenio Derbez as caring, warm-hearted Dr. Nurko makes you hope that all doctors out there are as good as him, as long as he cares about his patients. In conclusion, there is nothing to complain about this film. It’s a wonderful family film that will make you feel good. I don’t think there is much words left to describe the importance of this film to watch. But believe me, miracles happen every day. We just know nothing about them. This film brings faith, hope, courage, determination and willingness not to give up even if the circumstances demands that.